So, I took Xoie to the dog park over the weekend. Gotta start in on that puppy socialization and all. Xoie, like Vinz, is very much a people-puppy. However, to my delight, Xoie is not terrified of other dogs the same way Vinz was. We started out at the little dog park, seeing as though she is only 5.5 pounds and about 4 inches off the ground. She was not very amused by the little dogs though. When we took her to meet Tom’s dad’s dogs, she was trying to jump on the big one’s head. So after a little while we went over to the all-size dog side. She was having a BLAST! …that is, until the 3 big dogs that were wrestling FELL on her. There was easily 115+ pounds of dog on top of my poor little 5 pound baby. So she wasn’t feeling so playful after then. She ran over to me and made the “please pick me up” face and became flop-dog on my shoulder. Tried going back to the small dog park, but she just wasn’t having it. So then the next day we went back and she was queen of the little dogs, until somebody taller than her slobbered on her. Dog drool and dirt… ugh. So then it was bath time when we got back home. I wonder if maybe just bringing another small dog to my house for a few hours would be a better first step than the dog park. I wanted her to run around and wear herself out but she didn’t really do it. Any suggestions? BERKELEY SPRINGS, W.Va. — Their air might bring pollution complaints, but residents of Los Angeles drink the nation’s tastiest tap water, according to the judges of an international competition. More than 120 water sources competed in the 18th annual Berkeley Springs International Water Tasting, held Saturday. A panel of 10 journalists and food critics sampled sparkling, tap and bottled water from 19 states and other countries, including New Zealand, Romania, Macedonia and the Philippines. The title of best municipal water was shared by the Metropolitan Water District of Southern California, which serves Los Angeles, and the town of Clearbrook, British Columbia. Los Angeles won a gold medal in 1998 and has been in the top five in four other competitions since then, according to the competition organizers. “It means they give special care and attention to their water and how it is processed,” said event producer Jill Klein Rone. Am I reading this right? Los Angeles has the best tap water in the nation? Are these people crazy?! Take it from me… I spent 21 years in L.A. and the tap water is NOT tasty. In any way, shape, or form. It tastes metallic. Bottled water companies made a killing on me and my family. The tap water here in Portland is significantly better. I don’t buy bottled water anymore because the tap water here is actually drinkable. Those tasters…. have no taste. Durp. What other places have good tap water? Sunday is generally the House Work Day in the Katie-Tom Household. I think we skipped it last week and boy howdy, we have a glorious mess. I put all the clean clothes away, and am currently doing laundry. 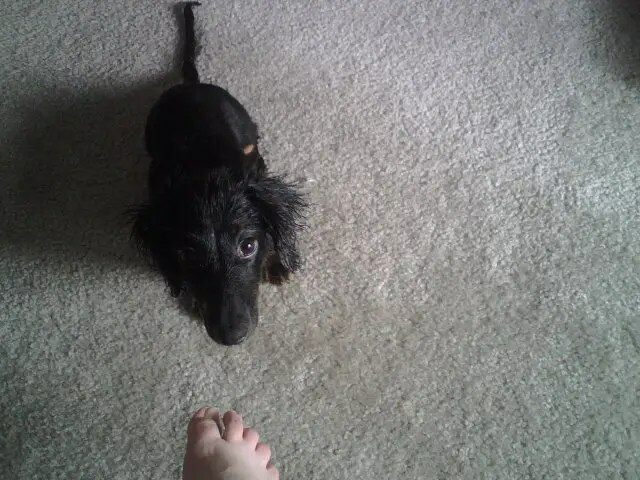 I also gave the puppy a bath cause she smelled funny. Tom is doing dishes and vacuuming. We picked up all the random trash and stuff and now the apartment looks like an apartment again instead of a pigsty. Yay clean! And he also bought a box of Samoas which are the greatest cookies in the whole wide world. I suppose if I really wanted to get through I could finish unpacking the boxes in the closet… but… meh! How’s the cleaning done in your house? I know, it’s such a fascinating subject haha. My grandma cleans her house (throughly) every single day. That seems like it’d be really tiring! Hrm. I went shopping today. I got my tax refund, and am about to go into a phase of my work life where I have to not spend money for a while. So, I figured I would treat myself to one last good shopping trip. Mind you, I hate shopping. So, I spent a few hours dragging my feet through the Lloyd Center with Tom-Tom pointing out things he thought I would like haha. It was great. I got 2 shirts and a dress-top thing (it’s like a dress but supposed to be worn with jeans under). Kind of spring stuff, super cute. I also bought a new pocket camera because my other one got lost. It’s tragic, I know. Poor camera. I think it ran off with Tom’s cell phone battery. I wanted to get some shoes but I couldn’t find any that I liked. Oh, and I still need to find one more pair of jeans. Anyway. Then I took a nap. That’s been my day. I don’t know what’s happening tonight. Dinner is coming up soon. That is all. So, some of you may know this, but I don’t have cable. And because I don’t pay for cable and also don’t have my TV even jacked into the wall because that’s where my router is connected, I don’t really get basic channels either. I get very fuzzy CW and Fox and that’s it. So needless to say, I don’t watch a whole lot of TV. Now we’re working on Heros. That show started out really slow but got good after a few episodes. Save the cheerleader, save the world! Bwahahhaha. Hahahahhaha. Ha. I’ve also been through House a few times. I love that show. Though it started to get a little lame. Oh well. Oh, and we also watch a lot of Family Guy, Futurama, and South Park cause Tom owns all of those. They just never get old hehe. What shows do you guys watch? I need to know what to put on my Netflix list after we finish Heros and Two and a Half Men.